Just look only … These specialties of Vietnam will make foreigners “Creepy”. However, if you “pick up” a piece into your mouth, the smell is “excellent” and you will want to enjoy more and more. 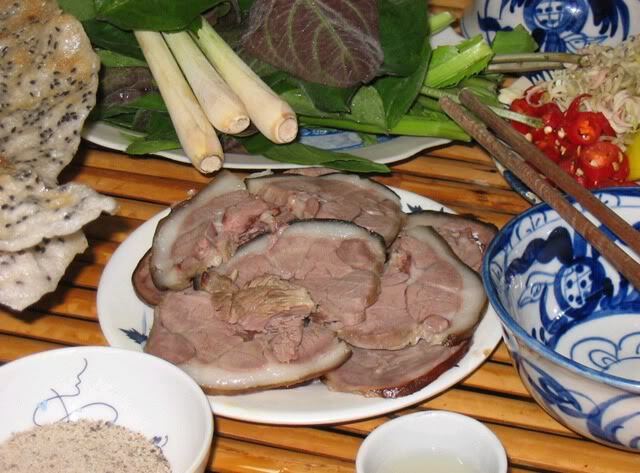 Dog meat is a favorite dish in Vietnam, especially in the Northern provinces. The dog-meat restaurant is very crowded at the end of each lunar month, because the notion that people eat dog meat at this time will have the effect of “bad blow”. Vietnamese usually cook dog meat into some dishes: boiled dog meat, baked dog sausage, steamed bowel, grilled meat, hot pot. The main spices for processing dog meat, including lemongrass, galingale, ferment, and the indispensable spice is shrimp sauce. In addition to the dog meat, Vietnamese people also enjoy cat meat and mice meat. 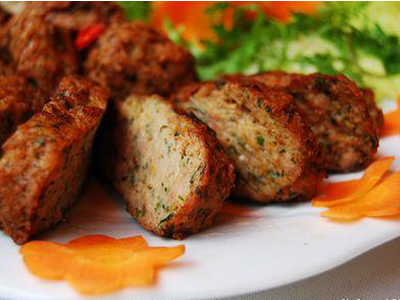 Cat meat has sweet, salty, sour taste, non-toxic, effective target barrel, detoxification, pain relief. 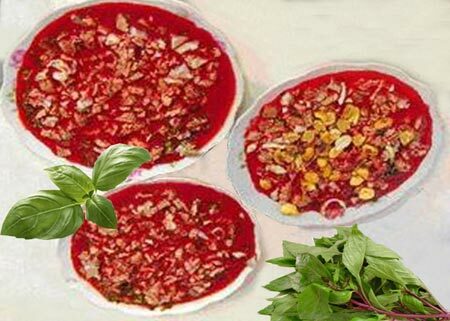 Used to cure tuberculosis, dizziness, chronic hemorrhoids, boils. With ethnic, the most addicted rat meat dish is still mouse hung upstairs kitchen. Mice were embedded boiling water, plucked fleece, punctured from head to foot with brochette and burned onto yellow sticky straw, and then disemboweled, removed viscera, washed, and then rubbed fish sauce, salt, seasoning, cardamom, pepper and some other spices, then hung upstairs kitchen. Fire and smoke in the kitchen burning during day and night will make the mice meat be extremely desiccated after a week. Shrimp sauce is a sauce made mostly from shrimp and salt, use 1 kind of shrimp digestive enzymes to ferment, creating distinct flavor characteristics. With Vietnamese, shrimp sauce is indispensable in many dishes such as bean noodles, bun thang, dog meat, cat meat… Foreigners arriving in Vietnam will see more and more strangers when know shrimp paste processing steps. Many people are allergic to the smell of shrimp sauce. 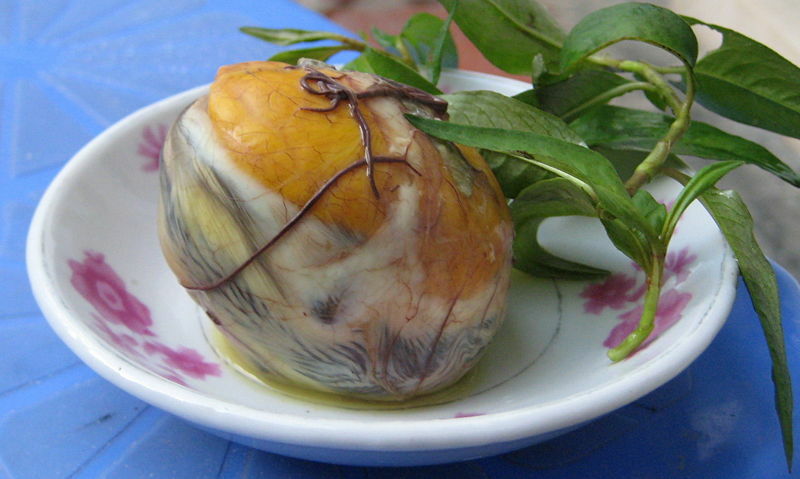 Balut egg is one of the popular snacks in Vietnam … and a nutritious food. However, this specialty is listed in the “10 best horror foods on the planet“. Balut egg dish is made from eggs of ducks when it is still in developing embryo. Eggs are peddled, or sold at the street corner, the small restaurant. However, many foreigners coming to Vietnam saw people enjoy it tasty, they shuddered. Vietnam is a tropical country so the general reptiles and snakes in particular are varied in type. But often, people only eat cobras, kraits snakes, and grass-snakes. For a long time, snake meat has been recognized as a precious medicine, named “Xa nhuc” and used to make alcohalature. Snake meat is sweet, salty, fishy smell and warm, effective treatment of diseases related to bones and joints, fatigue, toxic treatment. But facing the images chef knife slitting one line on the snake, then taking the tiny heart was throbbing inside into the disk, with thorniness feeling and the smell of blood when mixed with spicy wine are still major obstacles for foreigners. Also in the top 10 best horror food on the planet, blood pudding is a dish using fresh ingredients, this is fresh animal blood mixed with a little fish sauce or salt water before mixed with the pale flesh, chopped animal cartilage for curdling. As unique food in Vietnamese cuisine, pudding dish does not appear in the culinary culture anywhere else in the world. 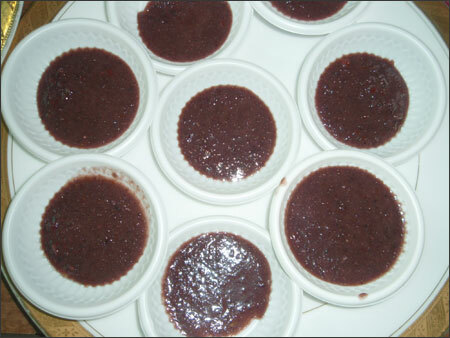 There are two types of the most popular pudding: pig blood pudding and duck blood pudding. Also common, there are duck swan, crab pudding, goat blood pudding, snake blood pudding, lobster blood pudding. It is rare to see dog pudding, chicken pudding, because these kinds of animal blood are very fishy or more harmful when eaten fresh. Often in many countries around the world, they usually do not eat the internal organs of animals, and just eat the meat at the back and abdomen. 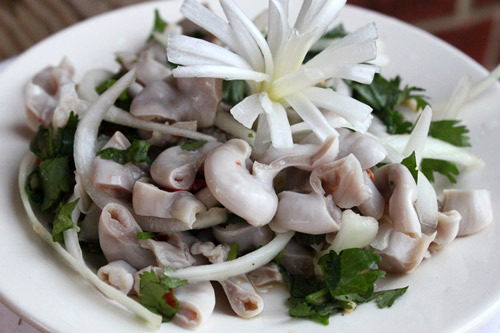 So when they came to Vietnam, they were surprised about the dish made ​​from organs and other parts of the animal. 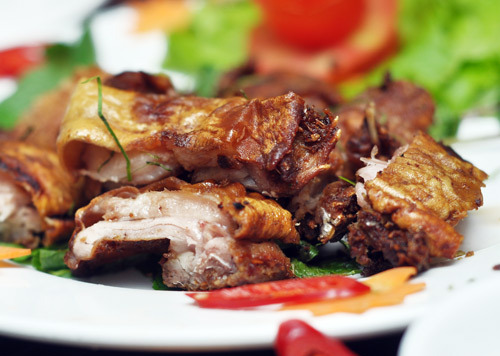 In Vietnam, every part of the animal intestine, heart, stomach, brain, kidney, feet, claws, tail, head, neck … can become a certain dish and not waste any parts. However, they are not too hard to eat. Rươi are living brackish waters in the North, usually only appear in the rainy season, late September, early October. Rươi are considered a source of nutritious and valuable food because Rươi only appear seasonally, in a very short time, they are the protein-rich, effective to improve health. Dishes are so delicious, but if anyone has saw Rươi alive for 1 time, which is not easy to be unafraid. Rươi look like leech hybrid centipede, they are many legs, mushy soft body, with all colors: blue, red, yellow, gray, thick stripes in the layer of viscosity as glue and the unpleasant fishy smell. 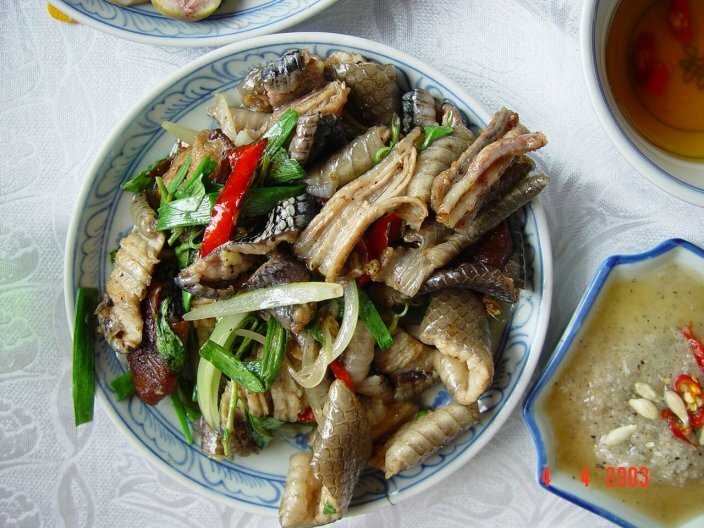 In Vietnam we often eat silkworm pupae, this is a dish contains lots of nutritious protein. 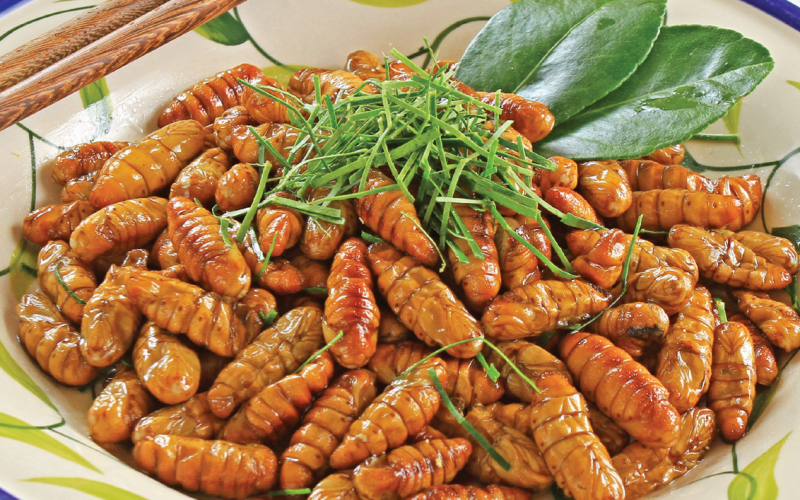 Silkworm pupae are silkworm in the preparation phase into butterflies to lay eggs, this dish is quite popular in the rural market. 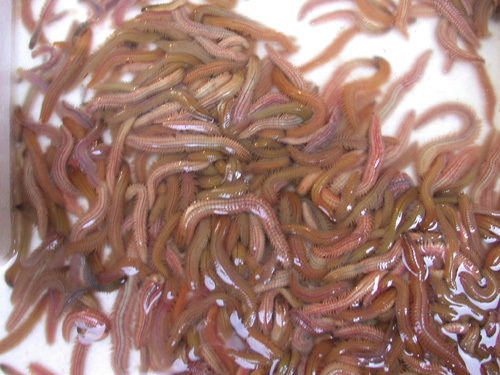 Foreigners say that they like the worms; in some Asian countries, they also eat larvae, bee larvae even. But in Western countries, it is absolutely not on the menu.